it is increasingly clear that the EU’s ranks of toadies and unelected Civil Service Fifth Column puppets are out to destroy democracy not just in the EU but more worryingly in Britain. Well you may remember the odious Mandelson’s mantra ‘In a largely post democratic era’ – do be minded Olly Robbins (known by many as Red Robbins!) held unelected authority in #Blair’s Government at the time. He is no newcomer to betraying the democratic wishes of the British electorate and it is worthy of note that his Father worked alongside the Marxist Prof. Milliband placed, as I recal by Jack Straw [whilst under the patronage of Barbara Castle subsequent to his leadership of the student riots of the 1960s & his period in exile in Chile] as head of the East London Polly when it gained University nomenclature & was the center of the crazy concept of doing away with exams & tests as they were competitive! So it would seem his Lewisham upbringing was not too distant from the odious Milliband brothers! Little wonder David Davis was no longer willing to continue providing a cover for the EU’s Remain Fudge! Minded it is always the victors who write the history it is all too likely that the text of the book will be in German just as it seems was the Chequers 120 page dossier of last weekend! As Theresa May was immersed in private talks in London yesterday, discussing her Chequers Brexit plan with Angela Merkel, a familiar figure was never far from her side. Olly Robbins, the Prime Minister’s Europe adviser, was on hand to provide detailed answers to queries from the German delegation. In the coming weeks, Robbins will be touring the capitals of the EU’s 27 member states to sell the virtues of the plan, particularly the fiendishly complex Facilitated Customs Arrangement (FCA) which he was instrumental in creating – incredibly without the knowledge of the then Brexit Secretary, David Davis. Sitting along side the Prime Minister last Friday at the now infamous Chequers summit, Robbins had watched eagle-eyed as Cabinet ministers waded through his 120-page FCA plan with senior civil servants on hand to answer any technical points arising from the document which had been months in the making. Since the botched general election of June 2017, Robbins, 43, has become indispensable to the PM, who defers to him on everything Brexit. Yet to many Tory MPs, not least David Davis and Boris Johnson, who quit this week as Brexit and Foreign Secretaries respectively, he is the great betrayer. They blame Robbins, a Europhile since he was at Oxford, for a series of unnecessary concessions already made to Brussels, on everything from the Northern Ireland border issue to the £39billion divorce payout, our obligation to accept the Brussels sequencing of negotiations and the ‘delay’ in publishing Davis’s Brexit White Paper (which has never seen the light of day). When Johnson, with a typically literary flourish in his resignation letter referred to the raising the ‘white flags’ of surrender to the EU, he wasn’t just attacking the PM. His real target was her consigliere. 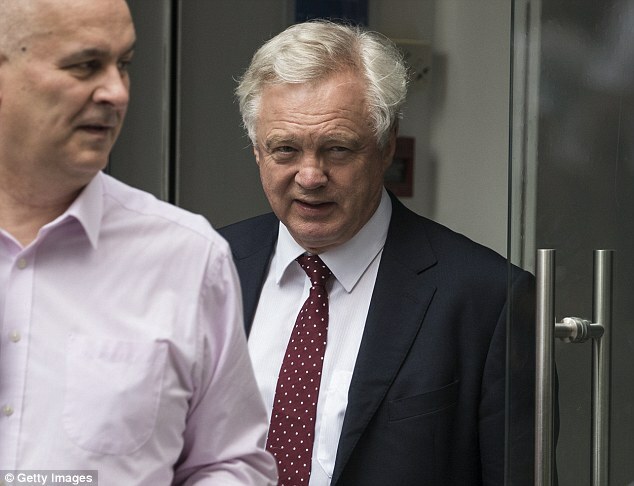 For his part, long before he totally snapped, Davis had run out of patience with Robbins, who was his first permanent secretary when the Department for Exiting the European Union was set up after the 2016 Referendum. Fans of the 1970s comedy classic Yes Minister will recall that at its heart was the power struggle between Jim Hacker, a Cabinet Minister, and his Permanent Secretary, Sir Humphrey Appleby. Davis also suspected him of informing on his every move to the PM. When Robbins was deployed to the Cabinet Office last September, Davis claimed it was because he forced him out. Number 10 insists they poached Robbins because they were losing faith in Davis’s ability to deliver. What is not disputed is the huge influence wielded by Robbins over the FCA plan which triggered successive resignations in the most tumultuous 24 hours of the May premiership to date. So who exactly is Olly Robbins, the man dubbed May’s Rasputin? Born and brought up in Lewisham, south-east London, and the elder of two sons, he was educated at the independent, £17,000-a-year Colfe’s School. His mother Diana gave up work as a civil servant to bring up the boys, while his father Derek, a professor of international social theory at the University of East London, wrote a book on French philosopher Pierre Bourdieu. After A-levels Robbins took the classic route for a civil service high-flier by studying politics, philosophy and economics at Oxford. He became secretary of the newly-formed Oxford Reform Club whose logo was a crowned portcullis – the emblem of Parliament – shrouded by the yellow stars of the EU. Founded in 1992 as Parliament was debating the Maastricht treaty, the club was established to oppose the Eurosceptic movement, and to promote European integration. Later, as its president, Robbins invited students to ‘star attractions’ including a talk by the German embassy’s finance attache on the euro and an event entitled ‘selling Europe to the citizen’. Even as an undergraduate, Robbins was known as ‘Sir Humphrey’ because of his tendency to use arcane rules to string out debates to his advantage. After Oxford, Robbins, was fast-tracked into the Treasury from where Tony Blair poached him and made him his private secretary at the relatively young age of 31. One of his most delicate tasks was to mediate between the warring Blair and Gordon Brown as their relationship deteriorated. When David Cameron became prime minister in 2010, Robbins, who has three sons with his wife Sherry, was promoted to deputy national security adviser, before moving to the Home Office to work with May as her most senior mandarin. At the time, her two most trusted advisers were Fiona Hill and Nick Timothy, who assumed control of everything from her wardrobe and speeches to deciding who had access to her. Robbins was accorded the ultimate accolade: he was allowed to see the Home Secretary alone without either of them present. When May moved into 10 Downing Street in 2016, Timothy and Hill went with her, occupying desks outside her study. Again Robbins, unlike most Cabinet ministers, would see her without Hill or Timothy present even though, as his permanent private secretary, he was supposed to be reporting to David Davis. Over time, the burgeoning relationship unsettled Timothy and Hill, who went as far as to warn Davis to be wary of Robbins as someone who had been appalled by the referendum result. They both feared, rightly as it turns out, that Robbins would use the civil service machine to try to frustrate the referendum result. 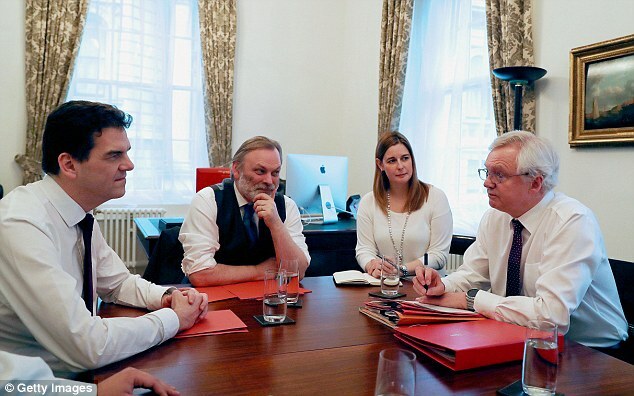 Following the 2017 general election, Timothy and Hill, who had written much of the manifesto, were forced out by ministers angered that they had been shut out of the campaign. Their departure meant that one of the last checks on the influence of Robbins had gone. A couple of months later and the transfer of power was complete, when Robbins was moved into the Cabinet Office reporting directly to the PM. He lost no time in flexing his muscles, telling Eurocrats in Brussels to ignore the political noise in Westminster and listen to May or to him, the PM’s closest adviser, but not Davis. At one meeting, Robbins even suggested that he, and not Davis, should be the opposite number to Michel Barnier, the EU’s chief negotiator. It’s ironic that the PM, whose election disaster was blamed on her reliance on two unelected advisers, now faces a similar charge over Brexit. The election cost May her majority. The row over an equally unelected Robbins and Brexit could cost May her premiership. (born 15 February 1964) is a British diplomat who is the current Permanent Representative of the United Kingdom to the European Union. Barrow was appointed as Permanent Representative in January 2017 following the resignation of his predecessor, Sir Ivan Rogers, and will play an important role in the United Kingdom Brexit negotiations. He was responsible on 29 March 2017 for formally invocating Article 50 of the Treaty on the European Union on behalf of the UK.